I am going to an ornament exchange Holiday party tonight and this dip will be my contribution (and probably most of my dinner, as I am not sure what else I will be able to consume safely aside from this and my GF Redbridge or a glass of wine). I am bringing along celery and tortilla chips to dip/scoop the dip with. 1. Heat chicken and hot sauce in a skillet over medium heat, until heated through. Stir in cream cheese and ranch dressing. Cook, stirring until well blended and warm. 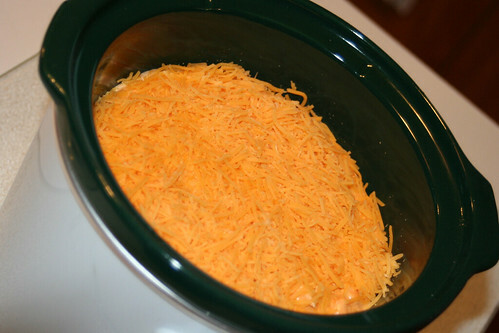 Mix in half of the shredded cheese, and transfer the mixture to a slow cooker. Sprinkle the remaining cheese over the top, cover, and cook on Low setting until hot and bubbly. Serve with celery sticks and crackers. By the way, the Buffalo Chicken Dip can also be made with Blue Cheese dressing…I know some who prefer that, but I like the Ranch better. You’re making me hungry! I’d probably try it with blue cheese. I haven’t found a ranch I’m allowed to have yet.